Let’s start exploring! 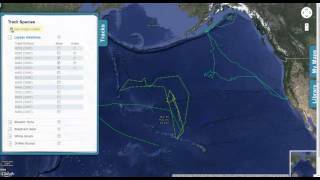 Below you’ll find some simple instructions and a set of tutorial videos that will help you get started on the Ocean Tracks map interface. 1. To access the map, click here. 2. The map works like other Google maps interfaces, with zoom and pan functions on the upper right hand side of the screen. You can also click and drag the map to get to a different location. 3. A small map on the bottom right hand side of the screen shows you a zoomed out view to help you orient yourself. 4. The map interface has a set of menus that expand from tabs on the left and right hand sides of the screen. Click the tab to expand the menu. 5. 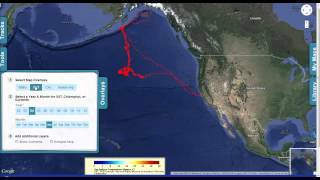 The track you see on the map was made by an Elephant Seal (#302). Watch the tutorial videos below to learn how to interact with this track and others. If you would like a guided exploration of the data, we recommend using our curriculum. 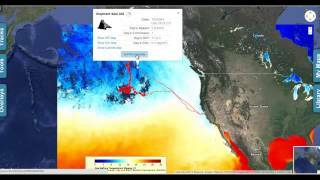 Please note that development and refinement of the Ocean Tracks interface has continued since these video tutorials were developed, so some functions demonstrated in the videos may not match the current interface. 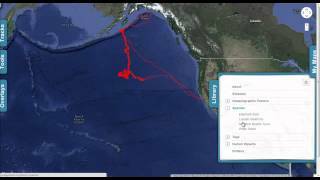 This video shows you how to select and display different tracks in the Ocean Tracks map interface. This is where you can turn tracks off and on, customize track colors, and make tracks "active" so you can explore them further using Tools (below). This video provides an overview of how to activate various features directly from the tracks themselves. Many of the track Tools can be accessed by simply clicking on the track in the map view, as an alternative to launching the Tools menu. 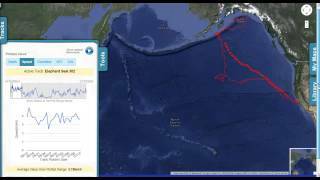 This video provides an overview of how to use The Tools menu in the Ocean Tracks map interface. Using these tools, you can get more detailed information about a track or specific portions of it. You can see how fast an animal was moving, how deep it was diving, how straight a path it was following, and what the ocean conditions were in its surroundings. 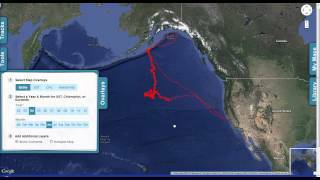 This video provides an overview of how to use the Overlays menu in the Ocean Tracks map interface. These tools allow you to add a background layer of sea surface temperature, cholorphyll, or human impacts so you can begin to explore the relationships between where an animal goes and the conditions it encounters. This video shows you how to access and use the Library, where you'll find more information about the animals and the ocean, as well as the technologies used to explore them. This video is a compilation of all the videos above. It takes you through all the elements of the Ocean Tracks map interface, just as they are listed here. Click the image to learn more about what "curviness" means and how it is measured. Click the image to learn more about how the hotspot tool works and what it means.